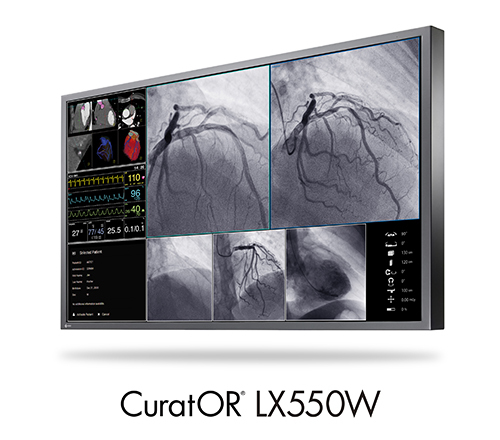 Karlsruhe, Germany, October 24, 2017 – EIZO GmbH today announced the release of the new 55-inch 4K UHD monitor CuratOR LX550W for use in interventional radiology and endoscopy. This widescreen monitor with 4K UHD (3840 x 2160 pixels) resolution is ideal for displaying medical images for angiography, cardiology or endoscopy in medical environments and can be mounted on a wall or ceiling mount. With the LX550W, the EIZO product range of large-format monitors sees the addition of a particularly high-quality model with IPS LCD technology. This technology is characterized by a very wide viewing angle. Image reproduction is thus made even more precise and efficient, regardless of the viewing angle. The LX550W has extremely bright LED background lighting enabling a calibrated brightness of 400 cd/m2. The LED background lighting is maintained at this calibrated brightness level thanks to the integrated stability system and ensures that visual impressions remain consistent over time. To ensure an accurate and uniform grayscale display, EIZO carefully measures the brightness values of each monitor during production and sets all grayscales to comply with the requirements of the DICOM Part 14 standard. With its five factory-calibrated gamma models, the LX550W can be quickly adapted to different image types to optimally display other image sources (e.g. endoscopic images) along with DICOM-based X-ray images. In addition to these predefined 12-bit Look-Up Tables (LUTs), service technicians can quickly and easily customize the LUT feature to meet local requirements. In particular, the built-in On-Screen Display (OSD) can quickly adjust the monitor to the prevailing ambient brightness at the installation site. The Picture-in-Picture (PiP) function lets you show multiple source images at the same time on the LX550W, so as to display a live signal directly on the monitor in an emergency, for instance. Visitors to the Medica 2017 trade show from November 13 to 16 in Düsseldorf, Germany, can see the new monitor at the EIZO booth, Hall 10, stand number H41. The LX550W will be shipping at the end of 2017. Date of availability varies by country so contact the EIZO group company or distributor in your country for details.